Our Saturday started out like any other weekend. Matthew and Joshua had a soccer game at 9am and I had a LLL meeting to lead after that. We loaded all of the kids into the van and headed to the soccer field. I was standing on the sideline watching my boys play soccer when Matthew fell a few minutes into the game. He fell forward onto his stomach and the coaches ran over to help him up. As he sat up and brushed the hair out of his eyes, I could see he was crying. And then I saw his arm. Matthew's right arm was hanging at a sickening angle. I ran (and it was quite a sight, I'm sure) across the field and put his head in my lap. Someone called 911. I tried to distract Matthew from looking at his arm and tried to keep him calm. I've seen broken bones before but the ones where the bones stick out sideways always make me a bit uneasy. A short ambulance ride later and we were at the hospital. Based on the way Matthew's arm looked, an orthopedist was paged. Sure enough, the x-rays confirmed that he'd broken both bones in his forearm and would need surgery to reduce the fracture. ...but he was able to smile briefly once he had some pain relief. We spent the entire day in the hospital. Matthew was upset when he realized his soccer season was over. He was a little disappointed that his birthday plans would have to change too. (His birthday is this Saturday.) 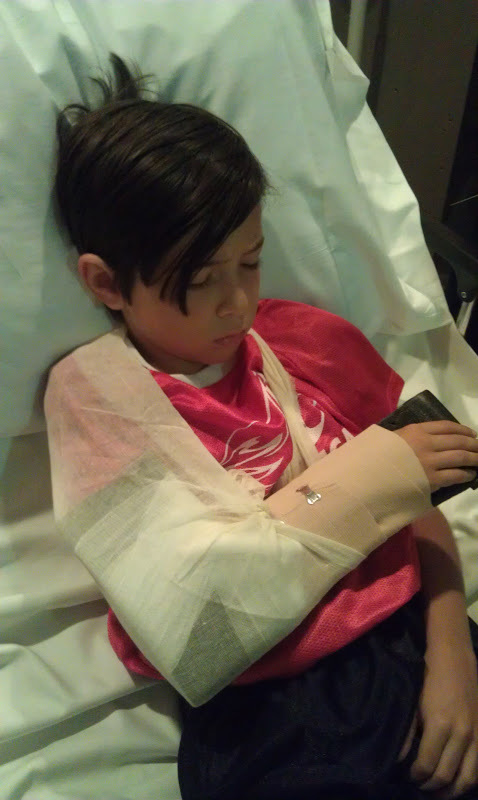 The realization that he won't be able to ride his bike for a few weeks was tough to accept. Not being able to do handwriting or math was not quite such a disappointment, of course. 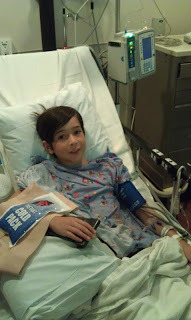 After the surgery, Matthew was bragging to the nurses in recovery that he was the first kid in his family to ride in ambulance. And after a few quiet days at our house, he's already back to bossing his siblings around as usual. Yep, 9-year old boys bounce back quickly! However, mothers of 9-year old boys don't have such an easy time. Maybe it's the pregnancy hormones or maybe it's just that my baby is turning ten this week but I have had a tough time the last few days. 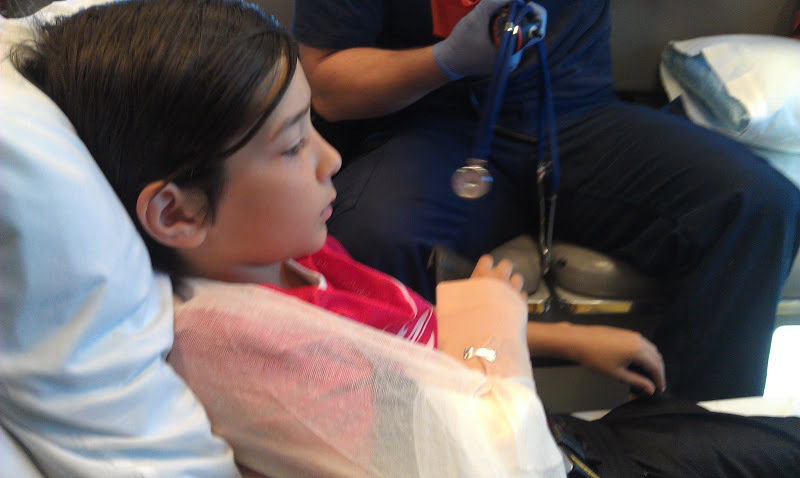 I was totally calm when Matthew got hurt and throughout our day at the hospital. I'm definitely not a helicopter parent. (I don't think moms of six children get to hover over their children, you know?) But on Saturday night I couldn't sleep. My usual pregnancy insomnia had been replaced with the upsetting images of Matthew falling, his tears on the field, and his awkwardly twisted arm. I replayed it over and over in my mind, trying to figure out what I could have done to protect my boy from experiencing that pain. And I can't protect him. He's going to experience pain. I know that. Is it just me or does a tenth birthday feel like a milestone? 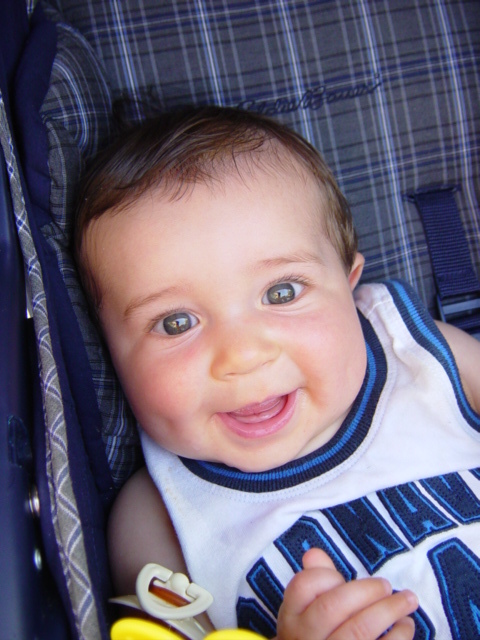 My baby is going to be one decade old. The first ten years with him have been amazing but at some point in the next ten years he will start to like girls, stop wanting to crawl into my bed at night when he has a nightmare, start driving, graduate from high school, and will eventually go off to college and grow up. And I'm not ready for that!